Ever since the Kadima party was formed the Jews have been looking at the word "kadima" and here are a few things I have heard on Israeli radio(1) that they've been saying. "Hamas" is "violence; violent crime" in English and "kadima" is "east; an easterly wind." "They shall come, all of them, to do violence, their faces set towards the east." In other words Hamas comes to do their violence and their faces are set towards Kadima, that is literally what the words are saying. They are coming to do this violence but they are taking their cues from Kadima, their faces are set towards Kadima. "And they take captives like sand." In other words, everything they are able to get away with, everything they are able to accomplish, it's by gazing at Kadima. And it was in fact Kadima that set the stage for things that are happening now in Israel. English And Moses stretched forth his rod over the land of Egypt, and the LORD brought an east wind upon the land all that day, and all the night; and when it was morning, the east wind brought the locusts. They continue by saying that in the Mekhilta (commentary on Exodus) you find that God collected the generation of the flood and the people of Sodom with a strong east wind and so also in Egypt the gathering of the locusts showing that God always chose to use an east wind, a ruach kadim (spirit of kadima) to be the agent of his retribution. English And Moses stretched out his hand over the sea; and the LORD caused the sea to go back by a strong east wind all the night, and made the sea dry land, and the waters were divided. The sages are stated as saying that the east wind is the strongest of the winds and God uses it to exact revenge from the wicked. This strong east wind was blowing the whole seventh night of Passover with tremendous power and dried up the sea and according to the sages every body of water in the world split at that time kind of like a testimony to what was going on with the people of Israel. That east wind was salvation to the Jews so who knows what the east wind has in store nowadayshow will it be used by God?how will the Jewish people be able to derive some benefit from it? There was another radio program on Israeli Radio (3) that stated that a certain Midrash (The Book of Eliyahu) showed that at the "end of days" an earthquake would happen in Israel on the 20th of Marchesvan (no year is specified in the Midrash). They speculated that seeing the 20th of Marchesvan was November 22 in 2005 and that that was the date that the Kadima party was formed that the Midrash's prophecy was fulfilled as this was considered a "political earthquake." The day after the elections Israel witnessed an 82% solar eclipse of the sun which hung a huge crescent shaped wedge of the sun over their heads. This crescent shape is commonly associated with Islam and I saw it as an ominous portent of bad things to come for the tiny nation. 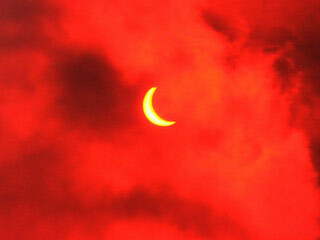 An 82% solar eclipse enveloped Israel in sudden darkness Wednesday. The eclipse began at 11:37 AM, peaked at 12:58, and lasted until 2:13 PM. 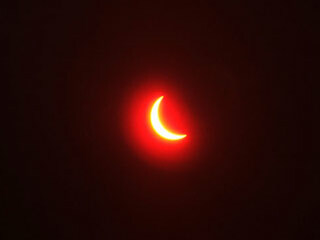 The following are pictures from the eclipse. As Israel digested the results of Tuesday's election, the sky went dark, the sun was slowly blocked out, temperatures dropped and animals howled, barked and crowed across the Land of Israel. An eclipse occurs when the moon passes between Earth and the sun during daylight hours, causing its shadow to pass across the planet. Viewed from inside the moon's shadow on Earth, the moon is exactly the right size to completely block the sun. From Israel, Wednesday's eclipse blocked 82% of the sun. The moon's shadow began in Brazil, crossed the Atlantic, Ghana, Nigeria and Chad. The shadow of the moon then passed by way of the Mediterranean across southeast Turkey and continued until Siberia. 2. Serve-A-Verse, The Hebrew Bible Explorer. 3. Link to Tamar Yonah radio show called "Prophecy and Current Events" dated 020706 with guest Dov Bar-Lieb.